What Are The Best Dog Toys For Doodles? Once upon a time, “doodles” referred to daydream-induced drawings. Now the term “Doodle” refers to various Poodle mixes, most commonly Labradoodles (a cross between a Poodle and a Labrador Retriever) and Goldendoodles (a cross between a Poodle and a Golden Retriever). Doodles are as cute and playful as their nickname. So it’s highly likely that your Doodle is crazy about dog toys. However, with the plethora of dog toy options available, it can be overwhelming pinpointing which toys are the best fit for your dog. We know your pup deserves high-quality toys, which is why we’ve researched toys perfectly tailored for Doodles. Games of fetch come second nature to Doodles. Every Doodle descends from either a Labrador Retriever or Golden Retriever. So, retrieving is literally in their blood! Ignite your Doodle’s retrieving instincts with fetch-friendly toys. A simple ball can keep your Doodle entertained for hours – or as long as your pitching arm can handle it. Tip: add some extra excitement and unpredictability to fetch by using bouncy tennis balls. Check out Bark’s fetch toys here! Appeal to your Doodle’s Poodle brain with Puzzle Toys! I bet you’re wondering, “That bouncing pile of fluff has a brain?” But don’t let Doodles’ goofiness fool you, they’re highly intelligent pups. Doodles need both physical and mental stimulation or they may become restless. 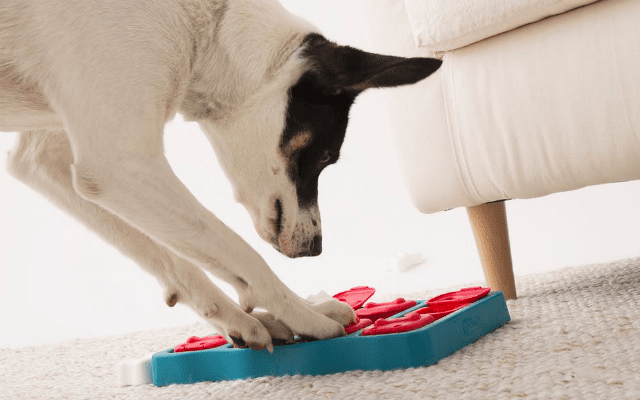 Puzzle toys like the “Dog Casino Puzzle” or the “Dog Brick Puzzle” are the perfect solution to curb doggy boredom! Check out more Puzzle Toys here! Doodles have pretty strong jaws. You may have already discovered this if you’ve come home to shredded sneakers and chewed-up chairs. Help your dog channel naughty gnawing behavior toward high-quality Super Chewer Toys. These toys – like the “Sledgehog” and the “Orbee Globe Ball” – are specially designed to withstand nonstop chomping and chewing. That’s right – no more weekly pet store trips to replace a demolished plush toy. Super Chewer Toys come in a variety of sizes, colors, designs, and features, so there’s surely a Super Chewer out there that’s perfect for your Doodle! Check out Bark’s Super Chewer toys here! Doodles are highly affectionate social butterflies. They’d win Miss Congeniality in every pup pageant! So nothing excites them more than playtime with their humans. Tug-o-war is the perfect game for quality time with your Doodle! Not only is it interactive, but it also helps Doodles burn off their high reservoir of energy. With their bite-able plush parts and stretchy ropes, Tug Toys like “Cunning Colin” are designed for epic games of tug-o-war. Check out Bark’s tug toys here! Hunting for the perfect dog toy is no easy feat, especially with a Doodle that seems to love everything. Furthermore, it’s likely that your wicked-smart Doodle will grow bored of that toy within a few weeks. So, what’s a Doodle parent to do? That’s where BarkBox comes to the rescue! With BarkBox, you won’t have to decide on a single dog treat or toy. That’s because BarkBox is a subscription service that delivers a curated collection of dog treats and toys to your door every month. Basically, it’s a canine dream come true. Plus, it saves you the hassle of finding and purchasing new dog goodies every time your Doodle grows bored of their old collection. Every BarkBox includes 2 Doodle-approved toys, 2 all-natural bags of treats, and 1 chew. Even better, each item is curated based on the month’s fun and unique collection.